LOS ANGELES (CelebrityAccess Mediawire) — BET Networks revealed its final additions to an their lineup for this year’s 15th annual “BET Awards” 2015 airing Sunday, June 28, 2015. Performers Tyga, Robin Thicke, K. Michelle, Janelle Monae and Jidenna have been added to the roster. The news follows the announcement of Janet Jackson as recipient of the inaugural Ultimate Icon: Music Dance Visual award with Ciara, Jason Derulo and Tinashe slated to perform a special dance tribute to the iconic entertainer. In addition, Smokey Robinson has been announced to receive the Lifetime Achievement Award and Tom Joyner the Humanitarian Award at this year’s ceremony. Additional names to be announced. The full list of “BET Awards” 2015 performers includes Chris Brown, Nicki Minaj, Meek Mill, Kendrick Lamar, Smokey Robinson, Big Sean, Ne-Yo, Ciara, Jason Derulo, Tinashe, Tyga, Robin Thicke, K. Michelle, Janelle Monae, Jidenna, Jussie Smollett, Yazz, and Serayah from the hit show “Empire,” Donnie McClurkin, Silento, Fetty Wap, Future, Omarion, E-40, Gary Clark Jr. Tori Kelly and Anthony Hamilton. Laverne Cox, Zendaya, Michael B. Jordan, Kelly Rowland, Saana Lathan, Michael Ealy, DeSean Jackson, Barry Floyd, Jay Ellis, La La Anthony, Lauren London, Teyanna Taylor, Allen Iverson, Brandy, Brittany Daniel, Donald Glover, Wendy Raquel Robinson, Boris Kodjoe, Nicole Ari Parker and Charlie Wilson are all slated to appear as presenters at this year’s ceremony. A full list of the “BET Awards” 2015 nominations is now available at http://www.bet.com/awards. The official “Live! Red! Ready! The BET Awards Pre-Show” is scheduled to air live Sunday, June 28 from 6:00 p.m. – 8:00 p.m. (EST) featuring former 106 & Park talent Rich Homie Quan, Natalie la Rose ft. Jeremih, Lil Mama, Travi$ Scott ft. 2 Chainz and Future, and the evening’s pre-show host Terrence J.
Stephen G. Hill, BET’s President of Programming, Connie Orlando, BET’s Senior Vice President of Music and Specials, Lynne Harris Taylor, BET’s Vice President of Specials, will serve as Executive Producers for the “BET Awards” along with Jesse Collins, CEO of Jesse Collins Entertainment. 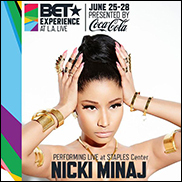 The “BET Awards” 2015 will air LIVE on Sunday, June 28, 2015 on BET and will premiere around the world on BET’s international network on Tuesday, June 30 at 9:00pm BST / 10:00pm CAT and will air live on MTV Australia for the very first time.